This pound cake is very versatile. It is absolutely delicious by itself with tea or coffee or with ice cream, sorbets, granitas, berries or other fresh fruit. Preheat the oven to 325 degrees F/160 degrees C. Set a rack on the middle level of oven. Butter a 9-inch round cake pan. Line the bottom with parchment paper, butter the paper and dust with flour. Beat together the 5 tablespoons butter, oil and sugar in a large bowl with an electric mixer until fluffy. Add the almond paste and lemon zest and beat until smooth. Beat in the eggs one at a time, beating well after each addition. Fold in the flour and baking powder. Pour the batter into the prepared pan and bake for about 1 hour, until a cake tester inserted in the center of the cake comes out almost clean. Let cool in the pan on a wire rack for 20 minutes. Unmold onto the rack and let cool completely. Transfer the cake right side up to a serving plate and gradually brush the lemon liqueur over the top slowly so it sinks in completely. (The cake can be made up to a day in advance; wrap with plastic wrap and store at room temperature.) 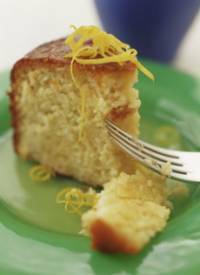 Just before serving, decorate top of cake with strips of lemon peel (optional) and dust top with confectioners' sugar. For the lemon liqueur, use Limoncello, imported from Italy or any other good brand of lemon liqueur.